...and happy 14th birthday, blog! I liked Yo! 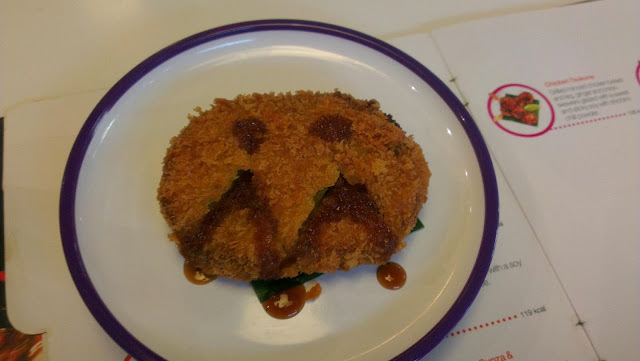 Sushi's quite subtle Hallowe'en decorations today - check out their pumpkin koroke (defo can't spell that). We begin a marathon of blogging now, sorry. I intended to blog every day in November, as before, but if I want to get to 127 posts by the end of the year I have to blog daily in December, too. If you need to stop reading for a while, I will understand. ...able to enjoy a martini and some olives over a good book at 5pm every day of the week, not just in half term. I also REALLY wish someone at Google would write a decent Blogger app for Android. Or even iOS. This is my second attempt at posting this from my phone. If WordPress can manage it there really is no excuse. 1. Sleep. Definitely in my top one. I could always do with a little extra sleep and if it's a bonus day off, I don't need to feel guilty about taking a daytime nap, or sleeping in. 3. Make chutney. This is usually my favourite thing to do in October half term. I haven't done it yet this week, but I have all the ingredients ready to go. On a day when it's not autumn this might say, instead, "make cakes". 5. Reorganise and gloat over my stash, like Smaug sitting on his huge pile of gold and gems. 6. Watch films I have already seen before, that therefore take no mental effort. Today, for example, I watched Angels and Demons. 7. Have a long daytime bath. 8. Go and see a friend for lunch and/or coffee. I am doing that four times this week. 9. Go and catch an unusual class at the gym. It's a whole different set of gym users during the day rather than the gossipy clique who frequent it during the evening, and there are all sorts of fancy classes that sound really fun until you do them and then you can't stand up straight for two days, yes I mean YOU, Fitball. 10. Go to the cinema on my own. I haven't done this for a very long time now, but it used to be that I'd go to the gym early and catch a film before 11am, when it was a little cheaper. Hmm, what's on? Maybe I'll do that on Friday. List prompt from Carole, as usual. * Alright, joking a bit. Work on Lassen Lake continues apace. In the pattern she says it's a quick knit, and she's not wrong. It's very motivational to see it growing out from the sleeves; at the start of the weekend I was maybe an inch lower than the collar and now I am starting the waist increases. 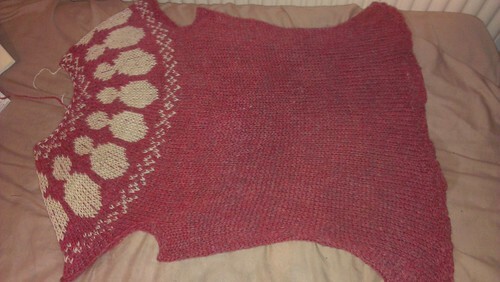 If I hadn't added an extra 10 rows to the body I would be on the bottom band. Damn long body. Any fears I had about running out of yarn are also totally unfounded; granted I am knitting from two balls since the colour is not especially even across the skeins (especially in the last ball where there are some very pale sections) but I think I will get the whole body out of three skeins, leaving me with an ample two for the sleeves. Loving being on half term and not having anywhere to go! Other than this, my only other achievements today have been watching the last four episodes of The Returned, having a two hour nap and going to circuits. I am full of win. Yes, I expect everybody knows I love stationery, even if they don't know me. I am a teacher, after all. I have a particular fondness for these pens. 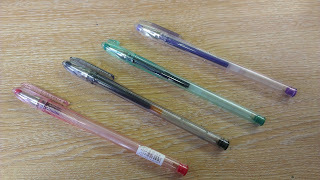 The label on them says they are Pilot G-1 0.7 pens and they are definitely my favourites. I was feeling quite sad this week because I had run down two red pens on the marking and was left with only a red biro - absolutely fine in normal circumstances, but requires a little more pressure than a gel pen and therefore not so good for protracted marking sessions, as they make the old hand ache. Luckily I rediscovered several red versions in a pot of old pens last night. I bought a whole box of green pens during last year's Greenpengate (when we were told we had to mark in green, ugh, but then nobody checked anyway) and I could do with a red box now, too. The purple one is especially special because it's a bit glittery. 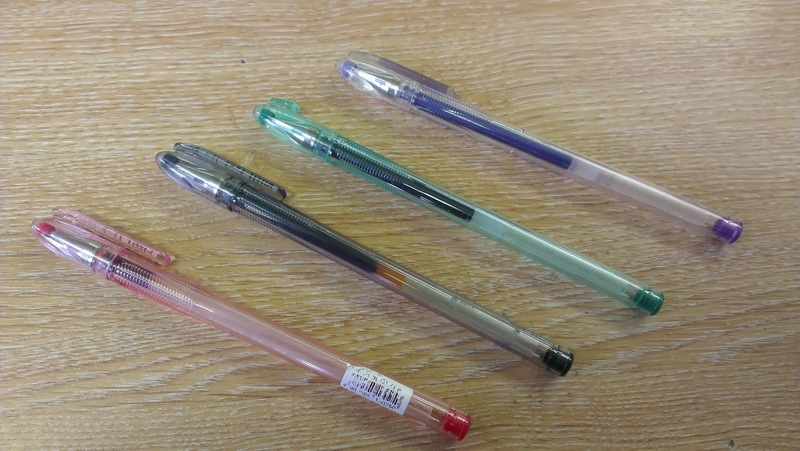 They are very smooth to write with and comfortable to hold. My only problem is that they are not very widely available, in my experience. Happy weekend! The mammoth term of exhuastion is finally over! I do love Bake Off, of course. I love baking. I even looked at the application form last year but since I once worked for 3 months as a prep chef in an American theme restaurant I am sadly precluded from applying. It's just as well - I'm not well-practiced at pastry or yeast and I am not overly fussed about it looking good. I missed the first series but have watched it ever since. Now it's possible to follow most of the contestants on Twitter, of course, and actually get their commentary alongside the show. So, last year I followed a few of my favourites; and as I read their comments I became aware that John was preparing for something that didn't sound like his pre-Bake Off career path. In fact, it sounded as if he was preparing to go away somewhere. Somewhere like....a baking school in France, perhaps? His ambition? I decided he had won. And then he had. "Should have put a bet on it," I thought. This year I only followed one Bake Off contestant. I don't particularly like spoilers, so I didn't seek the rest out. 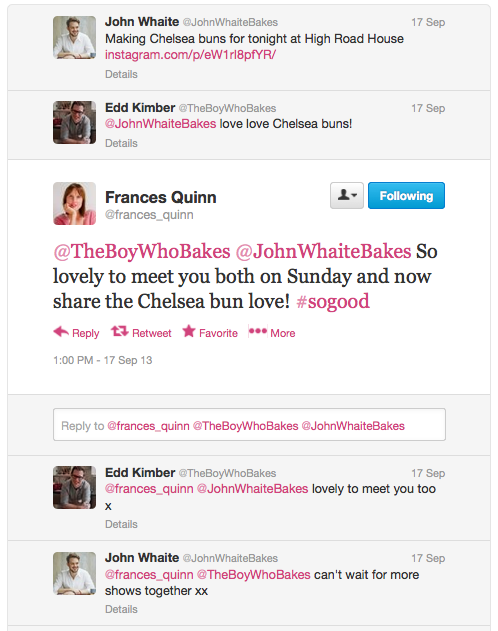 I did love Frances's bakes though. I thought the creativity was great. The match box delighted me in particular. So, I followed her, and then witnessed an exchange between her, John and first series winner, Ed. I decided Frances must be this year's winner. At times it seemed unlikely, because of that whole style-over-substance debate, but as the weeks rolled by, it began to look as though I had made a correct inference. And I had! I was quite pleased she won. It was clear she really took the feedback on board. I warmed to Ruby by the end, even more so when I read this because she clearly has quite a lot of fight in her, that didn't come across in the show. Kimberley was very good too. But Frances's had the edge, for me, probably because my own presentation is so awful: "Presentation - nil pois" as Mr Z would say. Next year I'm not looking at Twitter at all. * To be fair to John, I looked back through his timeline for this tweet and he seems to have deleted it. A momentary slip up, then. But, unfortunately, things on the internet do seem to stay there forever. Does this mean even people with tens of thousands of followers really forget people are watching? 2. Squash. We weren't really allowed it as children. I still mostly drink water but there's still something faintly illicit about drinking a big glass of lemon squash. The same used to go for diet Coke but I'm sort of over that now. 3. Kettle chips. They were the height of fancy-ness when I was young. Up there with Monster Munch. 4. Bagels. I was obsessed by them as a kid and they were almost impossible to get hold of. I loved living in Golders Green as a student because you could get them everywhere and at almost any time - bakeries full of aging, arguing Jewish men at 3am on a Saturday night and as much fresh bread as anybody could want after a night out on the town. 5. Really big muffins. Father Hand used to bring us CostCo muffins back from his trips to the US and a dozen would go in the freezer. One would feed me and my closest friends for a breaktime. They were about 7 times the size of anything you could buy here at the time. I don't eat them regularly now, but they are much more common. 6. Blueberries. They weren't really around back then, as far as I can remember.I think there is a much larger selection of exotic fruit than there was back then. 7. Fancy coffee shops. Bit of a cheat this one but I'm sure there weren't any, or I would have hung around in them, even though I didn't drink coffee. We used to go to Three Cooks in Southsea, or Snookies, which did better cakes and hot chocolate but which was dearer. 8. Gin. I felt very exotic drinking it - I remember trying it because I read an interview with Kate Moss in which she said gin and tonic was delicious, and what overweight 90s teen didn't want to look a bit more like Kate Moss and a bit less like a Snookies addict? 9. Curry. My parents were big curry fans and used to have biannual curry parties for all their friends. This seemed to involve a week of preparation, grinding spices, grating cucumber, making place cards and putting fresh candles in their large collection of dusty Matteus Rose bottles that lived in the shed. For a long time I thought all curry involved a massive effort, rather than a quick phone call and a payment to a delivery driver. 10. It's too late for me to think of number 10. Nearly half mine are drinks. Should I be worried? I keep finishing things and then surprising myself with my choice of next project. I really thought my next one would be Hannah Fettig's ribbed cardigan (yes, there are adult sizes) in my neglected Lorna's Laces Peppermint Mocha, because somebody bought me the pattern earlier this year and I wound the wool and everything. But then, when it came to it and the snowman jumper was finished and blocked (more on that disaster at a later date) I wanted something that sang of summer, so I hauled out some of the yarn I bought at Wonderwool and I started knitting a retro sixties style jumper from Wendy Bernard's Custom Knits. I am calling it Lassen Lake, because the colours remind me of a lake we visited there in the summer. Neither picture does the colour justice, of course. Between this and the pink linen top I am in danger of knitting up everything I bought at this year's Wonderwool before next year's Wonderwool. Better not plan any projects with it though, or it will never happen. I have a small Y7 class this year. Two, actually, and one larger one, but it's the smallest one I had an event with last week. We've been looking at significant journeys in history, and this lesson was about the journey of the Black Death to England and its impact. Of course, this involved talking about the symptoms of the Black Death and so on. And there's something special that happens with Y7 classes: they ALL have something to say. It begins slowly - I explain what a bubo was and what it might have felt like, so child 1 has to tell me about the time he had a spot on his arm and it burst, and then child 2 talks about their massive sponsored walk blister and how it ended up bleeding, and then child 3 has a story about bleeding. This is a curious Y7 thing. In the past, this sort of lesson derailing has taken up a good 45 minutes of the hour. They are so keen to share their story, not even recognising that they are becoming more irrelevant, that I haven't the heart to cut them off. There's something very innocent about it. It's not like when Y9 do it and it's totally obvious they're trying to waste some time. I think I should have a conversation about it with a primary teacher at some point and find out if it's rooted in some sort of class activity in a previous phase. Anyway. We got through children 1-7 and then child 8 told a long and quite graphic story about how, when she'd been 9, her finger had got caught in a cinema seat and had been hanging off, and they'd had to stitch it back on and then she'd had to go to court and had some money coming to her when she was 18. Child 9 put his hand up. "What film was it you were seeing?" he wanted to know. As I moved to cut this question off (it seems I do have limits), child 10 keeled slowly and calmly backwards off of his chair, landing on the floor and twitching. It was possibly the scariest moment of my career. Luckily he came to quite quickly; "Let's all talk about FLOWERS!" I called, with enforced jollyness, while we waited for the First Aider. Fourteen children suddenly had a new story to tell. Child 10 felt a lot better when first aid gave him some chocolate, and didn't even want to go home. I intend to adjust my scheme of work next year and avoid that lesson. 1. On Friday night I went to a Pampered Chef party. I drank wine out of a beaker. A lot of wine - it was a large beaker. It was the only way to get through women extolling the virtues of various bits of kitchen equipment - while I am willing to believe some of it was really helpful I struggled to believe that any of it was actually life changing. 2. I learned of the existence of a dual-purpose punch bowl slash cake stand. Amazing. Still not life changing, but very cool. I never make punch and cake is never around for long enough to require a stand, but I'm sure I need one anyway. 3. I found the bath products shop in Bradford on Avon and bought a new shower cap. Way more exciting than it sounds. It's a very frou frou shower cap in cherry print fabric with a big red bow on it. 4. I napped on BOTH days. 5. I did absolutely no work. Woooooo hoooooo! 6. 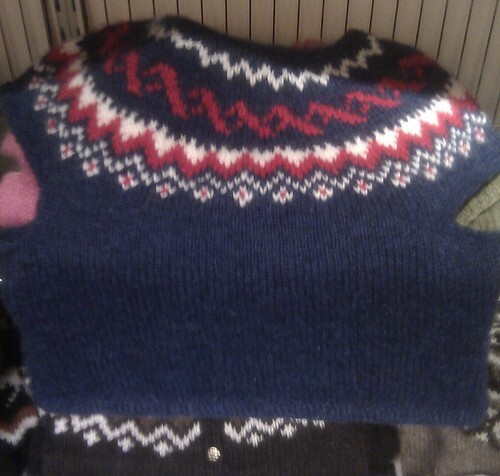 I read three new knitting magazines and finished knitting a jumper. 7. I went swimming. There is a little Asian guy who goes to the pool at the same time as me and made me laugh by explaining that he switched from a white swim cap to a black one because he's a Muslim, and some Muslims wear the little white hats and he doesn't want people to think he is THAT kind of Muslim. I laughed a lot at that. 8. I discovered a new tea from Pukka. It is three cinnamon. It is really tasty and very sweet considering it hasn't got any sugar in it. 9. I went to an aerobics class. It was a bit dull - lots of grapevines and knee lifts and so on, and when it came to the resistance band bit the instructor tried to make me use the easy band when I picked up the hard one, which was awkward. But I went - that was exercise number 8 for October. Well done me. 10. Did I mention the naps? I really did have the whole weekend as a lazy break. I really needed it. Eight week terms and two additional jobs on the side (both finished now, phew) and an Ofsted visit are not a happy cocktail. They just make one require a happy cocktail. 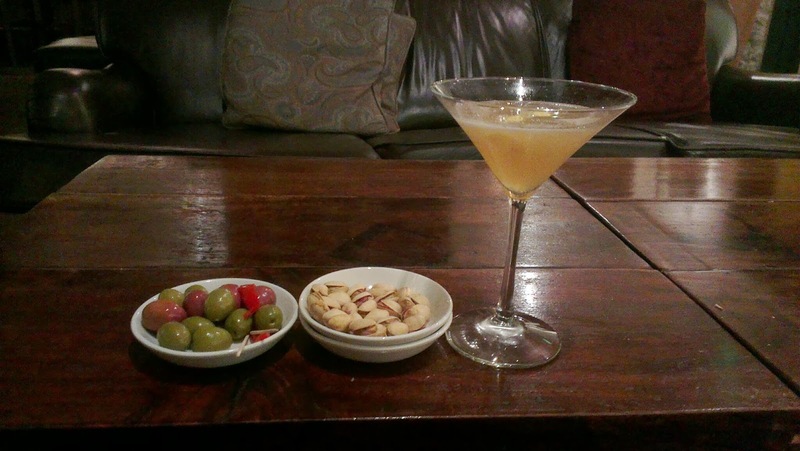 There are stories of much more exciting weekends at Carole's blog if you fancy it. I made the pattern up myself, and it went much better than I expected. I was worried it was too small, too big, too short....but it turned out lovely. I didn't want sleeves because it's bulky weight and I don't want it to be too hot to wear, but I do still have two balls of the tweed left so I might change my mind on that. (This might be the best value yarn purchase I ever made - I bought 20 balls from Jimmy Beans in the sale at $3.50/ball and it has done me two garments). 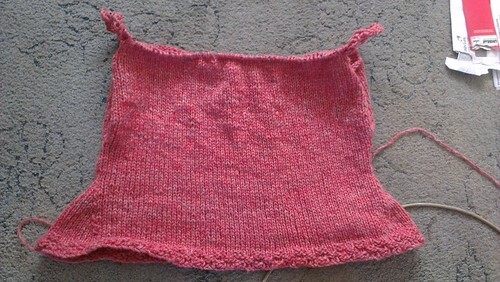 Next time I would distribute the shaping evenly across the row rather than concentrating it all at the sides, probably do a bit less shaping (my hips are wid but not that wide) and I would decrease less on the neckline. I wanted a wider neck, really, but what I have ended up with is something just big enough to pull over my head. Really I should rip it back but I am going to see how it wears first and I will keep it as is as long as it doesn't stop me from wearing it. 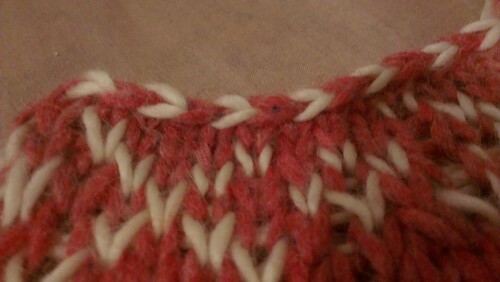 I especially like the candy cane bind off. I thought that was an inspired way to finish it. I might buy some decorations and make one of the snowmen more snowmanish - a carrot nose, some black bead buttons and eyes, and maybe a little sparkly scarf knitted from leftover sock yarn. I thought one like this would be enough as I don't want to make it too twee. But for now it's going into the FO pile. If you would like to participate, please leave a comment on this post. I miss doing a regular Tuesday Ten but I fear, now that I have reached over 100 posts with the tag, I am fast running out of things to list. I could come back every week and do "10 things on my mind" or "10 things I'm looking forward to" but, meh. I miss the prompts from Artsyville. I see she now does Glue It Tuedays and I did do some gluing today but it was on a work thing and although I am very pleased with it, it's not really fodder for this blog. Of course, I think it's fascinating to find out what our local infants' school is doing to improve writing, and you might too; but then I'd start feeling the pressure to glue something every Tuesday and most Tuesdays I just want to watch Bake Off and knit, you know? So, I was casting around online looking for inspiration and I found a new group doing a list prompt, so I am going to neb in on that and getting listing. 'Cept, this week's prompt is Ten Ways You Are Embracing Autumn. That's a bit too much like that post from a couple of weeks ago. Steal an old idea, of course. 1. I live at the end of a cul de sac. It is quiet and peaceful and we have off street parking. 2. There's lots of nature nearby, but not too near. Like, I can go walking in some dewy fields but the place never smells of muck-spreading, of which the same cannot be said about where I work. 3. Air balloons go overhead quite regularly. During the Balloon Fiesta we gets dozens in the space of a few hours. 4. The weather in the southwest is typically milder and wetter than the rest of the country (according to the geography textbooks I teach from, anyway). This suits me. 5. From my back bedroom window you can see hills and it is a lovely view, especially with a sunrise behind them. 6. Bristol is just great. There's so much going on and it's all so different. I love this blog post about it. 7. My commute to work is across fields and along rivers and through woods, the last of which smells gently of wild garlic for most of the sunny months of the year (though a good tramp around in said woods one Saturday afternoon yielded no wild garlic and one bleeding ankle). 8. The local centre, aka the 'wood, has everything one could need (except a butcher since it burnt down but I'm trying not to dwell on that too much). 9. There's lots of history to this place and it's still causing regular debate. I like a place that is argumentative about its history. Naturally I adore Portsmouth as my town of birth but it's a little bit smug with its pretty ships and chunky walls and internationally famous D Day Museum. Bristol history is not smug. 10. The cuisine. Pieminister and Hobbs House and lashings and lashings of cider. Well, it was a toss up between that and the accent. The Christmas jumper I mentioned in my monthly goals post is going great guns. I have tried not to think about it too much and just gone for what feels right. 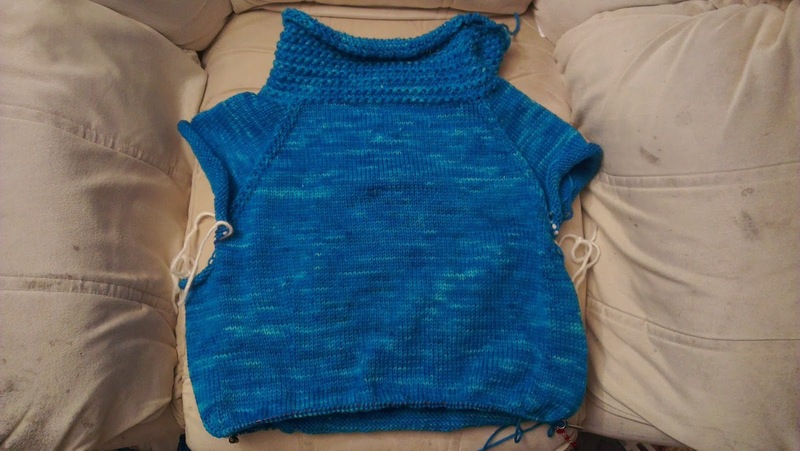 I'm not using a pattern, but I am trying to make it look something like this handknit slipover, which I saw in a shop in Iceland when we were there in 2011 (which was, by the way, nearly £100 - the Icelanders know the value of good knitwear). I have managed to chart some snowmen to go around the yoke but I am doing this almost totally blind, because I've never knitted a sweater of this type before. But I like a challenge and if I have to rip it out, so be it - the good thing about bulky yarn is that it knits up so quickly. 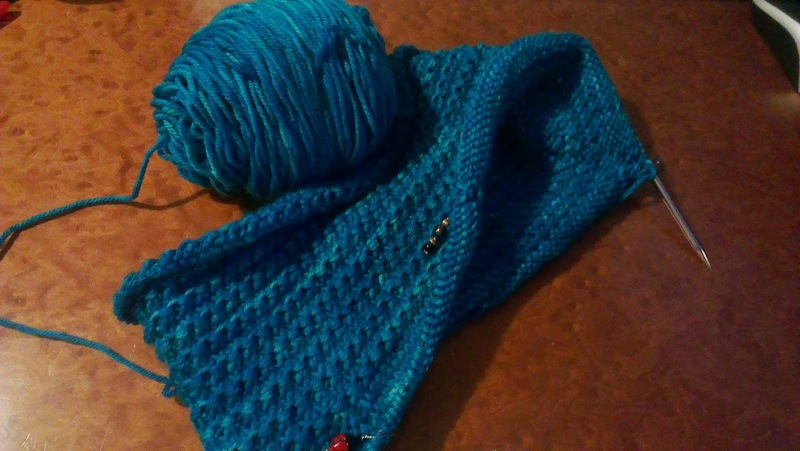 The yarn is Rowan Soft Tweed. I had eight balls leftover from my Ravelympics 2008 project, which I have just realised I never blogged about (if I think I am a slack blogger these days I need to remind myself of the desert years), and I'm going to pair it with cream Cocoon leftover from last month's bulky jumper. It felt like summer today, not October; but then as it started getting dark the air smelled like bonfires rather than barbecues and I could believe autumn was really here. Finish the Christmas jumper, aka "don't let the colourwork put you off"
It's always a good time for chutney! 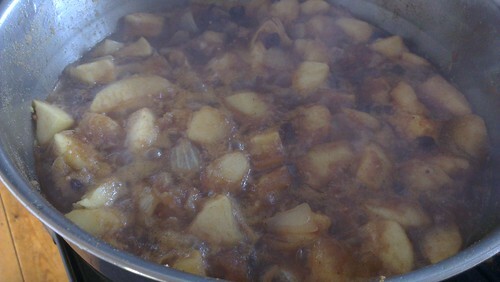 From the last time I made chutney, I liked this type the best. I doubled it up this time. Heat the vinegar and the sugar until boiling. Add all the other ingredients except the walnuts and bring back to the boil. Cook until it's, well, chutney - probably 3-4 hours. Cool a little, stir through the walnuts and then pot into sterilised jars. Keep for a month to mature. I am going to say yes to this. I have found it quite easy to stick to and it doesn't feel like a chore to eat tonnes of lovely fresh veggies and meat and fish. Thanks to sticking to it for a month my tastes have already changed - yesterday I had a slice of bread and butter for lunch and the butter just tasted of salt. I'm definitely going to keep going with this one. Well, no. I used my gym membership 7 times, which means I paid £5 per visit - not too bad. I did, however, visit other classes/saw my PT 8 times through the month, for 15 exercise sessions in total. Not too shabby considering how busy I have been. No wonder I haven't had much blogging time. No. It has just been manic this term so far - I can't believe five weeks have passed, because I have achieved nothing. I blame the re-marks, of which there were 35% more than normal, and the app-writing. All my school time is spent marking and planning lessons so that I don't have to do any of that at home. Yes - well, I did one so far. It was not very well attended. I hope next week's will go better. No, but I did get as far as talking another staff member into helping me. Yes - see last blog post for far too many pictures of it. Yes, this is about half done now. 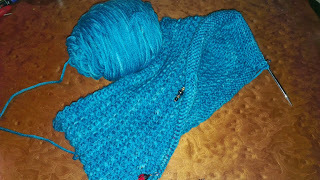 Oh, how I love bulky weight yarn. I found a number. I rang and left a message. They didn't ring back. So - not totally my fault! Reorganise the wardrobe so I can actually see my clothes. Sort of - I have taken out a lot of summer clothes and dresses I only wear occasionally. I still need to make a visit to Ikea to buy some storage boxes so I can put things like fancy dress clothes and ski wear in the loft. Only managed eight. Sadface. I had many good intentions. I am blaming the re-marks, again.